The Ripley Wolves won the WOAA Sr. A championship in seven games over the Shallow Lake Crushers. They came back from being down 3-1 in the series and won Games 6 and handily, 7-1 and 5-0 respectively. The Ripley Wolves won three games this weekend to come all the way back from a 3-1 series deficit and win the WOAA Sr. ‘A’ final in seven games over the Shallow Lake Crushers. The Wolves won Game 7 by a comfortable 5-0 score, thoroughly dominating the deciding game from the drop of the puck and scoring all five goals in a wild second period. The game could have taken a different turn early in the first when the Crushers jumped on a turnover at the Wolves blueline for a clear cut breakaway, but Jason Reid stood tall and kept the game scoreless. From that point on, the Wolves played a smart, disciplined, defensively-sound game and let their natural talent up front go to work in the middle frame to put the game out of reach. The win gives the Wolves their first championship since they won the ‘B’ title back in 1995. Goals were scored by Brett Catto, Nick Locking, Tim Dwinnell, Tyler Devos and Drew Davidson. Those who got assists are currently unavailable. The Wolves executive thanks the players, coaching staff, volunteers, sponsors and fans for their dedication this season. It is a massive commitment to be a part of this team, and you all deserve to enjoy this accomplishment. The Ripley Wolves look to complete the comeback from a 3-1 series deficit this afternoon after hammering Shallow Lake 7-1 in front of a capacity crowd last night. The Wolves came out of the gate flying and were in control of the game from start to finish. Shallow Lake’s goal came with just three seconds left in the game. Game 7 will be played this afternoon at 2 p.m. at the Bayshore arena in Owen Sound. The Ripley Wolves live to see another day. 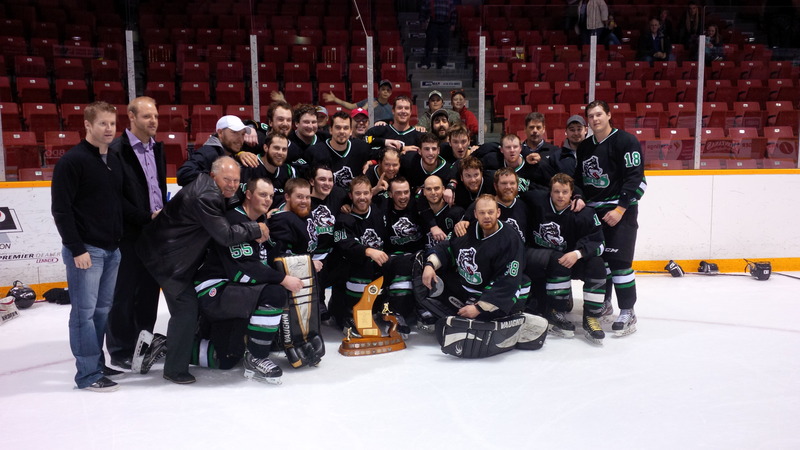 The Wolves pulled out a 3-2 win in overtime on Friday night at the Bayshore in Owen Sound, forcing a Game 6 in the ‘A’ final, which Shallow Lake now leads 3-2. Game 6 is tonight at 7 p.m. in Ripley. Game stats are currently unavailable, though Ripley did outshoot Shallow Lake by a 43-29 margin in regulation. Please note, the Ripley Minor Hockey Banquet is tonight, meaning there will be no upstairs seating or bar for the first period or two at tonight’s game. If the Wolves can pull out another win, Game 7 will be held at 2 p.m. on Sunday, at the Bayshore in Owen Sound. The Ripley Wolves will battle for their playoff lives this weekend, after losing Games 3 and 4 in the Sr. ‘A’ finals over the weekend. The Wolves fell by 6-4 and 5-3 scores and trail the Shallow Lake Crushers 3-1 in the best of seven. Game 5 will be Friday night at 8:30 p.m. at the Harry Lumley Bayshore in Owen Sound. If necessary, Game 6 will be Saturday night at 7 p.m. in Ripley, and Game 7 is slated for Sunday at 2 p.m. at the Bayshore. The Shallow Lake Crushers took a 2-1 series lead in the Sr. ‘A’ final after a 5-3 win on Friday night at the Lumley Bayshore in Owen Sound. The Wolves look to knot the series at home tonight at 7:30 p.m.